Today, I am happy to share real life story of Nihaz, one of Money View Personal Loans customers. Nihaz who is 27 years old, lives in Kerala and works in the IT industry. It is a known fact that men and bikes share a very intimate bond. Something to do with men and good looking machines. Nihaz wanted to cement his by buying a top-notch bike. The only hitch was the finance part. Nihaz knew how to take care of that by applying for Money View Loans. How did Nihaz come across Money View Loans? Nihaz was browsing for personal loans online when he came across Money View Loans. He checked reviews in the Play Store. Out of the first 100 reviews, he found only 2-3 negative ones, rest were glowing praises. This increased his confidence in the credibility and speed of Money View Loans. He then downloaded Money View Loans App.. His loan application got rejected the first time as he had submitted wrong documents. When he rectified that mistake the second time around he got the loan approved and disbursed. Nihaz stressed many times that the process was hassle-free and easy. After downloading the App, he just followed the process mentioned. He uploaded the documents carefully after the first rejection. Within 32 hours his loan was approved. He remembers receiving the call around noon explaining that his loan had been approved. And by evening the money was in his bank! He was impressed and pretty grateful! Nihaz says that he loves the simplicity of Money View Loans App.. All updates are clearly shown on the App. Ease of Getting a Loan: Just download the app, upload the documents required and the loan is approved within 48 hours. The ease of the entire process was above his own expectations. Speedy Disbursal: Nihaz got the money in his bank account within 48 hours. Even I was impressed hearing it. What more can any loan customer ask for? This without a single followup and reminder. Hassle-free Process: The App has no hidden clauses, needs no face-to-face meetups or long red tape. Just download the App, upload the documents mentioned, wait for the update on your App and your loan is approved within 48 hours. Get Personal Loans Easily: Whether you wish to buy a bike, take a vacation or need money for an emergency, with Money View Loans getting Personal Loans is now really easy. Customer is the Winner: No need for collateral, no running to banks with lengthy paperwork, Money View Loans has made customer the focus. Now anyone can get a personal loan. 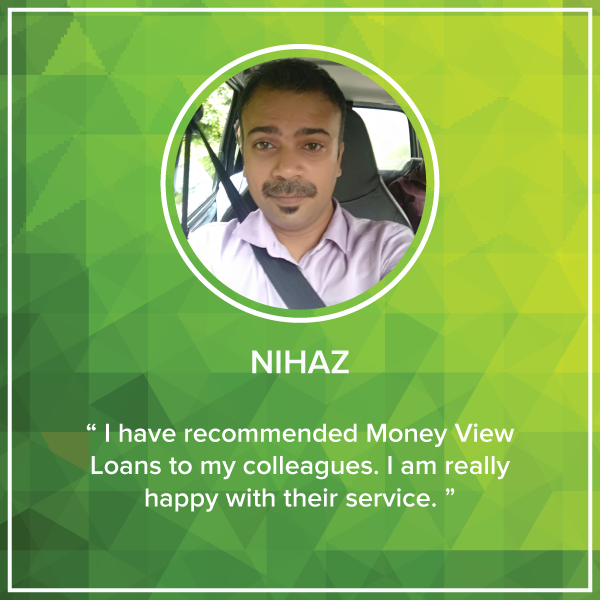 It was thrilling to hear the appreciation of Money View Loans App from Nihaz. We hope he is enjoying his shimmering new bike. I will recommend this app for all. To manage daily expenses and so on. I also would like to recommend it for loan. Within few hours I got the loan into my account without any difficulty. Nice and i am also very happy with you because i also already got a loan from you, thank you. This is a really good and helpful company. Yes , Really this app is very usefull to us .